One of rock’s first guitar gods, Goree Carter’s legacy only began to be recognized long after he passed away, but his impressive body of work and ahead of its time pyrotechnics on the instrument clearly created the template all other rock guitarists followed ever since. Goree Carter was born in Houston, Texas the last day of 1930 surrounded by music from childhood. His father played piano and trumpet, his family hosted jam sessions that featured such saxophone luminaries as Eddie “Cleanhead” Vinson, Illinois Jacquet and Arnett Cobb and his sisters introduced their younger brother to the rapidly expanding guitar stylings of blues legend in the making T-Bone Walker from whom he drew initial inspiration. 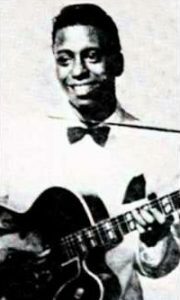 By his mid-teens Carter was already drawing notice for his abilities and got his first break playing at the El Dorado Club in Houston on his first electric guitar. He was sent to Nashville by a local woman acting as a talent scout for an extended period where word of his talent began to take hold. Record companies came knocking at his door and he even had an offer to go to Hollywood but since he was underage – still just 17 – his mother turned them down. Back in Houston he was surreptitiously recorded on a T-Bone Walker-like blues which was issued without his knowledge as the flip-side of a Little Willie Littlefield song in March 1949. Carter wasn’t happy with the deceit nor with his performing in another artist’s style and when he signed his first contract – now 18 – he was determined not to become a Walker imitator and instead set out to established a different style – his OWN style – which was rock ‘n’ roll. Already he was talented songwriter, crafting almost all of his own material including his most memorable, “Rock Awhile”, in the studio when pressed for another song. His lyrics were sharp, the guitar accompaniment was inventive and incredibly influential and his vocals, inspired by Roy Brown but with a different textural bent to them, embodied the youthful drive and optimism that defined rock and separated it from the blues and older idioms. He became Freedom Records most notable and prolific artist and worked well alongside tenor saxophonist and arranger Conrad Johnson and pianist Lonnie Lyons. He also acted as a inadvertent talent scout when he met Big Joe Turner and his wife in town for a show. Turner had heard Carter’s work and while hanging out together in a club Turner came up with the idea for – and wrote at the table – the song “Adam Bit The Apple” which he recorded for Freedom when Carter brought him to his manager in search of a record deal. Carter’s work was consistently popular along the Gulf Coast region but Freedom Records had limited distribution and decidedly limited aspirations, constantly trying to push Carter into a blues direction against his will, simply because it happened to be popular in the area. Though he enjoyed playing Walker-styled blues at live gigs he largely avoided it on record where he preferred to follow his own muse as a rock artist. Unfortunately before he could become better established and find a more experienced manager with a better business sense to steer him to a bigger label with more foresight Carter was drafted into the Army in 1950. He was in the service for a year and when he got out by all rights his career should’ve picked up where it had left off, especially since the rock sounds he’d created had started to spread wider and rock ‘n’ roll as a whole was becoming ever more popular by 1951, but instead his career all but ended. Freedom Records had shut down over lack of quality artists with his departure and his manager had left music as well, getting into the donut business. Carter, who despite his brief musical sojourns and his time in the Army, remained a somewhat sheltered homebody, moving back into his mother’s house and going to work at a rice mill to support her. He would sit in with visiting musicians, including blues acts like B.B. King, when they came to town, but he never got another break. Records came out on a succession of smaller labels, most of which were cut by unscrupulous record men telling him to just play to hear how he sounded on mic, never telling him they were recording the results to be issued – obviously without contracts or advances, let alone royalties. By 1953, not yet 25 years old, his music career was over just as the style of rock guitar he pioneered was about to break through thanks to the obviously indebted Chuck Berry and others to follow. Carter barely did more than occasionally play around the house from then on, the same house he was born in and the same house he’d die in at the age of 52 in 1990. That, in the end, probably explains why Carter never lived up to his early potential and broke through to wider acclaim. He had the misfortune to fall in with inexperienced and unscrupulous local wheelers and dealers whose only real ambition was making a few quick bucks around Houston and who didn’t have the brains, the ambition or the vision to see that there was a larger world out there ready to be conquered. Carter himself was too passive, too willing to accept what fate handed him instead of going out and creating his own fate through relentless drive and determination. Only on record did his long suppressed drive and determination burst forth on a handful of incendiary tracks that at last have rescued him from obscurity to give his name more than just a little in the way of passing recognition as rock’s first transcendent guitar hero. As sideman… behind Lonnie Lyons.